An English Homestead: Permaculture Soft Fruit? The veg garden is where the main area of my produce comes from. This could be argued is the opposite from a self supporting system. 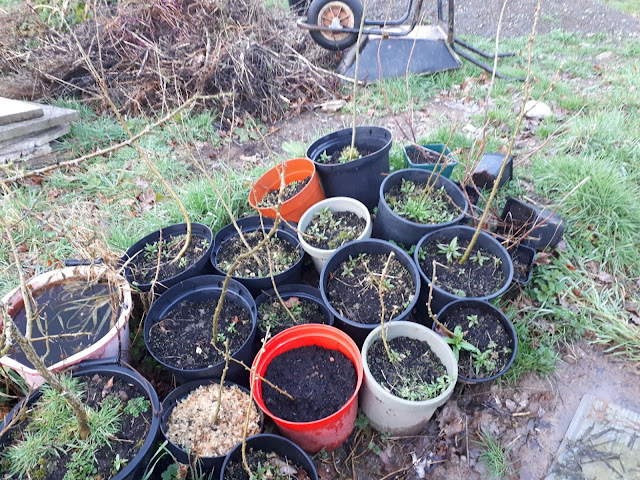 Besides the fruit trees that line it, everything is an annual, normally started in the greenhouse and beds prepared with imported fertility (not always from outside my smallholding though. One area that is in between these two is my soft fruit. Left to their own devises they have produced year and on year and need little in the way of work or imported fertility. One thing it did need was regular weeding, something I neglected and as such had to clear the area out. This gave me an opportunity to try out something new. 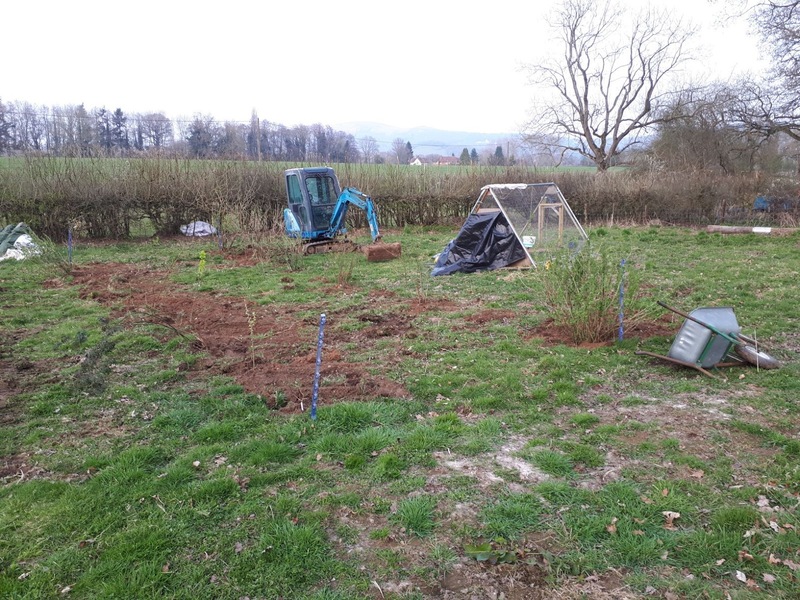 One half of the orchard isn't planted with trees yet, and as such is used for pasturing the chickens as I move their pens around. 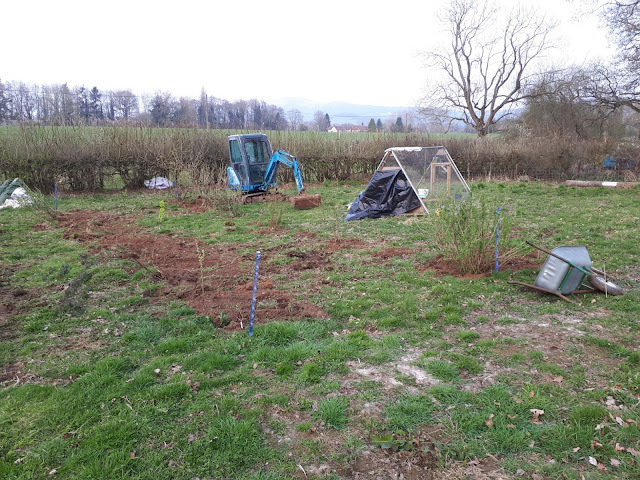 I have wanted to plant this area up for a while now and kept toying with different ideas (cider trees as cordons as one) but with the soft fruit garden needing moving it was a perfect time to move it and try one that will create a semi self supporting system over time. The idea came from videos of a permaculture orchard by Stefan Sobkowiak. He has no two plants the same to each other, the idea being that it prevents the rapid spread of pests, and every other plant is one that helps improve its surrounding, mainly nitrogen fixers. He then interplants fruit bushes, then herbs, in affect creating a sort of forest garden in a line. Chickens also run down the aisles as pest control and fertilise the pathways. My idea is to cut out the top canopy layer (hard fruit as my space was no where as big as his. Then to plant fruit bushes separated up with nitrogen fixers. Also with really wide rows between (12ft) so they can be mown or, if I feel so inclined, planted with veg. Even when they have a radius spread of 4ft I can still have a 30inch wide bed down the middle to grow things like squashes etc, if they veg garden is full. I could also squeeze in some herbs at the base of the bushes as well while they are young. Siberian Pea tree/shrub. Grown from seed two years ago! They're not easy to germinate but this is far cheaper than buying plants big enough. The nitrogen fixers I have chose should also serve two purposes if I want as well. They are Siberian Pea Trees, although I intend to grow them as bushes. They are a member of the pea family and fix nitrogen in their roots. They also produce tiny edible peas. Now these aren't really supposed to taste of anything, but will make great forage for my chickens and apparently they have saved villages of Russians as a starvation crop in the past. I fully intend to try these in the future! So with quite generous spacings I managed to get the bushes in on the same weekend I cleared the old fruit garden. Of course I used the digger to make things a little easier for me. I've gone for 4ft between each bush at the moment, so that will be 8ft between fruit bushes. My last fruit garden everything was just growing too close together and I'd rather have space to get around the bushes to pick everything. So far I only have two rows in. To be honest that's probably all I'll get in this year and I'll look out for interesting fruit to plant over the next season or two to add to it over time. I have the space for four rows in total, although one might be just for autumn raspberries. In these rows are blueberries (an experiment to see how they get on in unaltered ground), honeyberries, blackcurrant, redcurrants, blackberries and gooseberries. I now plan to mulch the bushes with some well rotted manure, then cover in old sheep flease. I'll then use woven plastic weed membrane down either side of the row. 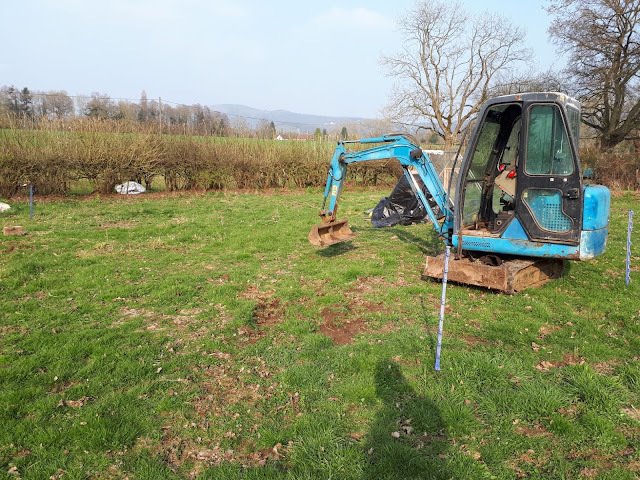 The centre bit will be mowed and mulched this year, hopefully I'll be able to add lots to this centre area and get it ready for growing next year, maybe even having some green manures in the summer if the mulch does the job with the grass. Do you have many self supporting systems set up in your growing area? What companion planting do you use? Lots of excitement there. Well done with the siberian pea tree plants. I tried growing from seed but failed. I did buy a plant which is surviving on a slope, but really it's a bit cool and damp for it here. You could try some other perennial food plants. I find good king henry makes a pretty good ground cover (although the chickens will probably eat it too! ), sweet cicely is another that is pretty well behaved andcdoesn't mind a bitbif shade. I've tried interplanting with comfrey to auto-mulch the fruit bushes, but you have to get the spacing right, otherwise you just get weeds or swamp the fruit. Alfalfa may be a good alternative for you. The seeds were tricky to germinate and the young plants are adored by slugs! Perennial food plant wise I have four cuttings from perennial kale growing well but would like more. I had sweet cicely for years but lost it to the fruit garden! Must get some more. I have about 100 comfrey plants boarder my veg garden so I can use this as a mulch. I'm looking to grow more fertility and tried (and failed) to grow alfalfa last year so must try again. Might work well down the rows to be honest. I did grow lots of sunflowers for compost but let them flower as they were too nice (I'm soft). As for ph I'm not sure but the blueberries were in the ground before and did well. I do add some soft wood shavings around them which I think helps the ph a bit. I love the idea of putting mushrooms down as well. I want to really increase the number of herbs I have growing here, I'd love to just have them self set everywhere and have them to deal with instead of nettles! I need to chuck some borage seeds about this year! I'm adding fruit bushes around my garden but sadly no space to put a big nitrogen fixer like Siberian pea tree in with them. Sea buckthorn seems an unstoppable force. I planted one in a nusery bed a few years ago to grow on and get a bit n=bigger and now I need to get the digger to move it!